This GT40, chassis GT/108, is the first Roadster ever built. In October 1964, the bare roadster chassis was delivered by Abbey Panels to Ford Advanced Vehicles (FAV) in Slough with assembly starting on 2nd November. With only six roadsters ever being built, Ford was clearly experimenting to understand the market appeal and saleability of a GT40 Roadster. Also, GT/108 is one of the twelve early prototypes to wear a three-digit chassis number as opposed to the ‘P’ designation which soon followed on the Mark 1 production cars. GT/108 is the only roadster to continually survive in its original configuration, and one of the four GT40 Roadsters built using a steel chassis. This car was photographed at FAV in February 1965 with construction being completed the following month. A Ford 289 cubic inch engine was fitted with Weber carburettors mated to a Colotti four-speed gearbox. The bodywork of GT/108 displayed minor differences to the previous GT40 prototypes, including a new nose section developed by Len Bailey at FAV, and rear-pillar intakes that were taller than the standard beltline scoops. Borrani wire wheels were fitted, 6 ½” at the front and 8” at the rear, with Goodyear tyres. The bodywork was painted white and on the 2nd March 1965 GT/108 was tested at Silverstone alongside GT/105, where it was driven by Sir John Whitmore, 1961 British Touring Car Champion, and Richard ‘Dickie’ Attwood, 1970 Le Mans 24 Hours winner. John Wyer was also present at Silverstone to oversee testing on the 2.9-mile circuit. According to GT40 historian Ronnie Spain, less than a week later, GT/108 was invoiced to Shelby American from FAV with a note of “temporary importation for test purposes”. However, upon arrival Shelby American brought the car into the USA on a permanent basis. This roadster was shipped to Shelby’s Venice, California facility where a Shelby American Work Order was issued on 4th April 1965 to ‘perform necessary repairs and mods to GT/108’. Within the cars extensive history file are images from both the Silverstone test, and arrival at Shelby American in Los Angeles. At the end of April, GT/108 accompanied the Shelby Cobra Team to the Riverside USRRC where it was exhibited throughout the race weekend. Then in early May it again accompanied the Shelby Cobra Team to the Laguna Seca where it was demonstrated by Ken Miles, 1966 Daytona 24 Hours and Sebring 12 Hours winner. Ken was an integral part of the Shelby Cobra Team where we was affectionately nicknamed ‘Teddy Teabag’ for his drinking of tea, or ‘Sidebite’, as he talked out of the side of his mouth, and on the Sunday of this meeting went on to win the Manufacturers race in the Shelby works Cobra CSX 2431. One week later, on the 16th May 1965, GT/108 attended the 3rd Annual South Course Concours d’Elegance at Newport Beach in California. It is then understood that Ken Miles again tested this GT40 in preparation for Le Mans at Riverside. In early July, this roadster was again exhibited, this time at the new Shelby American LAX complex where the Ford board of directors were meeting, with GT/108 performing demo runs for the Ford VIPs with Ken Miles handling the chauffeuring duties, until Henry Ford II himself slid into the passenger seat, at which point Carroll Shelby pulled rank and took the driver’s seat from Ken. This is the only time Henry Ford II is known to have ever been in a GT40. Ken returned to driving duties for Mort Sahl, considered by many to be the very first of the breed of stand-up comedians. Duties with the Ford VIPs finished, GT/108 returned to testing at Riverside on 27th July, again with Ken Miles taking the wheel. Also on this day, two journalists, Jerry Titus and Brock Yates took to the wheel for features in Sports Car Graphic magazine, and Car & Driver magazine. Jerry Titus commented “impressed by the comfortable seats and driver positioning, we found it extremely simple and dependable to control from the first lap”, also opining that the roadster was “quicker than the best a competition Cobra could hack.” GT/108s’ impressive history file contains many images from this day, along with a copy of the test report from Shelby America listing the car as completing 28 laps. Mid-August 1965, this Roadster Prototype was relieved of its duties as a Shelby promotional and development car and was taken under consignment by Hank Madeiros at Hayward Motors in San Francisco. By September GT/108 was photographed at Kar Kraft in Detroit where it is parked alongside GT/107, the 1965 long-nose Mark II from Le Mans. Then, in October the same year, this Roadster is featured in Sports Car Graphic magazine, based on Jerry Titus’ experience with GT/108 at Riverside in July. The article claims Ken Miles had been testing the car to determine in what form it would be delivered to customers. Over the weekend of the 1st to 3rd October, GT/108 completed demonstration laps at the Watkins Glen US Grand Prix. The nose has now been painted a non-reflective black as on all the prototype coupes. Jim Clark, recently crowned double Formula One World Champion, took to the wheel of this GT40 Roadster, in fact this is the only GT40 Clark is ever known to have driven. The history file contains images from this day with Jim Clark behind the wheel, and behind a microphone talking to the crowds about this GT40 Roadster Prototype. At the end of October 1965, Ford produced a document called “Ford GT cars in the system”, which lists GT/108 as being located at Kar Kraft and notes it as a “Development car for ‘J’ and ‘X’ models.” The following month, Car and Driver published Brock Yates’ article on GT/108 from the Riverside test in July. On 31st July 1969, Ford compiled a document listing the GT40’s still in storage. GT/108 was included in this list with approximately ten other GT40’s. This roadster’s first private owner was George Sawyer in Detroit, a young Kar Kraft employee. Along with the team at Kar Kraft, Sawyer made the car driveable for the road, they rebuilt a 289 motor and ZF transaxle from the prototype Mach 1, as well as repainting the nose white with the twin-stripe. To register the car for road use, Sawyer obtained a special certificate from Ford and registered the car in Michigan with the registration ‘LVZ-233’. Sawyer became enamoured with the art of metal work during his time at Kar Kraft and began to take jewellery classes in his spare time. Rather than keep this GT40 Roadster, he chose to sell it and used the proceeds set up his own jewellery business, which continues to this day. Sawyer sold GT/108 to Harley Cluxton III who formed GTC (Grand Touring Cars, Inc.). 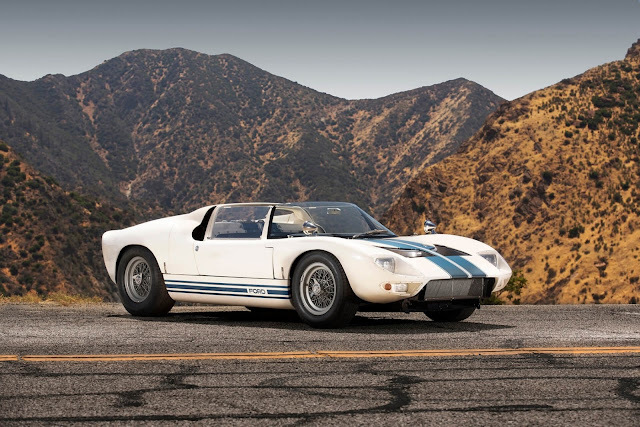 Cluxton sold the car to John Robertson of Big Fork, Montana who maintained it in the same configuration, unlike all the other GT40 Roadsters which were modified or changed. By 1983 Cluxton III was again owner briefly, before selling this car to Tom Congleton of Mission Hills, Kansas who quickly embarked upon a complete mechanical restoration. Following this work, Tom and his son, Mark, periodically entered vintage competition events such as Laguna Seca in 1983. It is worth noting that this GT40 Roadster was not modified to accept the large and more competitive wheels as many of the GT40’s in historic racing at this time were. This undoubtedly restricted its competitiveness, however did maintain its originality, and authenticity which has been maintained to this day. In July 1986, this GT40 Roadster attended the SAAC 11 convention in Detroit, making it onto the cover of ‘The Shelby American’ magazine, before featuring in one of Autoweek’s April 1984 issued. In September 1989, GT/108 took part in the incredible 25th Anniversary GT40 Reunion at Watkins Glen before passing through Cluxton’s GTC again to world renowned collector John McCaw in California. In 2003 McCaw commissioned a substantial mechanical freshening by the renowned Phil Reilly and Company in Corte Madera, California. During John McCaws ownership of GT/108 he entered the car to only the best events, for example, Pebble Beach Concours d’Elegance in 2003 where it finished second in the Ford GT40 class. The car was always stored in McCaws climate controlled facility alongside the other jewels in his collection. In July 2011 McCaw commissioned Ronnie Spain to inspect GT/108 in California. Then in 2013 this GT40 Roadster was invited to the Amelia Island Concours d’Elegance, celebrating the 50th Anniversary of the Ford GT40. In 2014 Ronnie Spain compiled a detailed report on the complete history of Chassis GT/108, a copy of which is included in the cars history file, prior to it crossing the block at the RM Auctions Monterey sale in August the same year. GT/108 is the first GT40 Roadster built, and the only to survive continuously in the same, original form. It is without question one of the finest, most original and certainly the rarest examples of the Ford GT40 in existence.